The anodising line at Alupco ... state of the art. ALUMINIUM Products Company (Alupco), one of the largest suppliers of aluminium extrusions in the Middle East and amongst the top 10 worldwide, continues to support the construction of landmarks all over the region by providing the most creative aluminium solutions. The Dammam-headquartered company is now focusing on further growth through adopting new technology, enhancing its expertise and increasing its product diversity. Its protective extruded aluminium products and door and window systems have helped carve a niche for the company as the market leader for creative aluminium solutions in the GCC, Africa, and Europe. Alupco’s powder coating line ... more than 16,000 colour combinations. For 40 years, Alupco has been providing its expertise in creative aluminium solutions across the Middle East and North Africa (Mena) region. 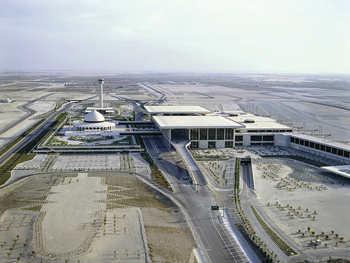 “Alupco is the market leader for extruded aluminium profiles that have been surface treated, so it is no surprise that it has been the backbone of so many prestigious and prominent projects over the years like the King Fahd International Airport in Dammam and Prince Mohammed Bin Fahad University in Al Khobar,” says Saad Tahsin Al Waheb, marketing supervisor. Alupco uses a two-step anodising process to form a durable, porous oxide film on the surface of aluminium, enhancing the protection provided by its natural oxide layer. This electrolytic process also prevents the colour from fading over time under UV (ultraviolet) light. “Anodising is one of the most effective ways of protecting your investment in terms of your property. Anodising of aluminium profiles acts as an extra oxide layer, giving the aluminium extra hardness as well as lowering its heat conductivity. The anodic coating becomes part of the base metal and will not chip or peel,” explains Al Waheb. He says although there are many different techniques of anodising, such as dye colouring anodising, these are not as effective as the type of anodising process Alupco utilises in its factory. King Fahd Airport ... an Alupco project. 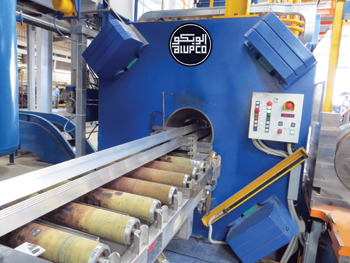 “Dye colouring anodising is not UV resistant, which means the colour will fade and/or change in less than six months when exposed to the sun, whereas Alupco’s method of anodising lasts up to 25 years,” Al Waheb claims. 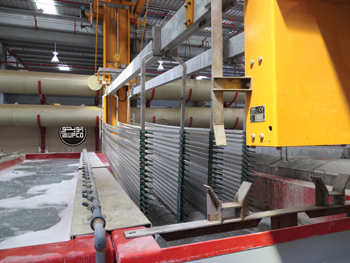 The company has recently installed a new anodising line in Jeddah and is in the process of setting up a new line in Dammam. Turning to powder coating, Alupco says it offers more than 16,000 different colour combinations. “If a colour requested is not available, it can simply be made at the factory by mixing other colours together. Powder coating gives the advantages of consistent colour and availability while also providing corrosion resistance to aluminium extruded profiles,” he says, adding that the company is the largest consumer in the world of powder coating material from Jotun Powder Coatings, part of the Jotun Group which is a leading manufacturer of decorative paints, marine coatings, protective coatings, and powder coatings. Alupco’s product portfolio comprises more than 16,000 profiles for doors, windows as well as curtain-wall systems. 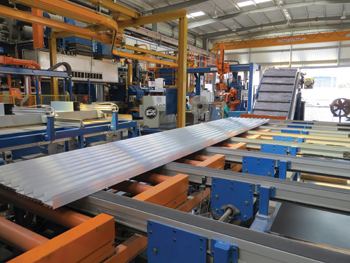 Al Waheb points out that aluminium is particularly suitable for the manufacture of profiles since it is light weight. “It weighs a third of the weight of copper and steel, yet it is one of the strongest metals. The high strength-to-weight ratio means less load on the building’s structure. This is especially important for buildings in seismic zones as seismic forces are proportional to the structure’s weight,” says Al Waheb. Profiles cutting process ... modern. He says that by using Alupco’s extruded aluminium for window frames instead of wood or polyvinyl chloride (PVC), manufacturers can design slimmer, more elegant framing without sacrificing strength and rigidity. Slimmer frames mean a larger glass area and more natural daylight. 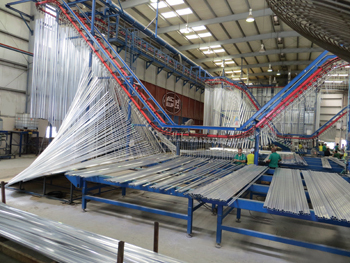 “Aluminium is also 72 times more rigid than wood and 23.2 times more rigid than PVC,” Al Waheb asserts. Furthermore, Alupco’s aluminium extrusions are impervious to humidity, temperature, warping, or becoming brittle which increases their lifespan. They also do not absorb moisture so they won’t swell, shrink, split, crack, rot or rust. The company’s products retain their physical properties over time. “All of these features ensure our aluminium extruded components resist deformation caused by climate changes which help buildings retain their basic structure, strength, stability, and durability,” Al Waheb says. Alupco has a special system for every door and window application. “From the 50SG system to the Saraya, Alupco can fulfil every need of the consumer. More importantly, Alupco has its own thermal break system,” Al Waheb says. Alupco is a market leader for extruded aluminium profiles. Alupco assists fabricators not only supplying its own door and window systems but also gives them the option of using other international systems, such as AluK from Italy, and Schuco from Germany. “This gives our clients a range of options to fit their specific needs,” Al Waheb says. He says aluminium fabricators use Alupco’s thermal-break system to address thermal conductivity issues and create highly thermally-efficient window and door systems. The company has already installed two new thermal break lines to meet the demand for this application, he adds. Alupco has established a sound reputation as a dominant figure in the aluminium industry worldwide. In the Eastern Province alone, it has been at the centre of some of the most prominent hospital projects such as Saad Hospital and Procare Hospital. It has also been a part of other projects in the province such as the Movenpick hotel, SaudConsult’s headquarters, the Dhahran Mall extension and the AutoMoto showroom.